Path to Publishing is a new blog series in which I interview published authors. It’s a great way for them to get free exposure as well as help other writers who are trying to get published. 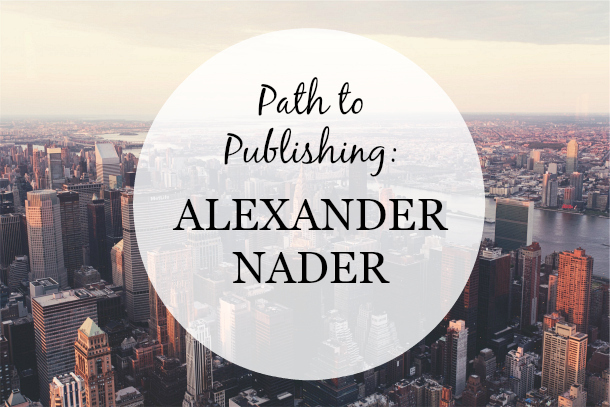 This week, I’m featuring urban fantasy writer Alexander Nader. Alexander Nader. I write mostly urban fantasy, but for some reason I hate the term ‘urban fantasy’. I like to think I write noir fantasy. Most of my stories are humorous, but I take my joking very seriously. I’ve always written stories in one way or another, but I decided to pursue writing novels seriously in early 2012. John Dies at the End was the biggest reason I started writing. After high school I didn’t read books. I hated everything I was forced to read in school and I was convinced that all books were ‘literature’ and not for me. A friend recommended John Dies and it changed my life. It was the first time I realized people are writing books that I want to read. Since then, I’ve buried myself into a lot of noir. Raymond Chandler and James Ellroy and Dashiell Hammett and the like. I’ve honestly never reread a book. There are too many wonderful books I haven’t read. If I had to choose, though, it would either be HORNS by Joe Hill or The Long Goodbye by Raymond Chandler. Hill’s grasp of human emotion is captivating and Chandler’s super dry approach to wit keeps my entertained. I’ve tried both and anyone who says one is clearly better is mistaken. The freedom of self-pub is awesome, but at the same time, the support and encouragement from a publisher can be most helpful. The networking aspect of working with a traditional publisher was great for getting me pointed in the right direction. What’s your writing routine like? What about your process? My routine is random and crazy. I work a lot so I have to squeeze in words whenever I can. The last couple novels I’ve plotted out vaguely, but my newest addition is all fly by the seat of my pants. It’s terrifying and awesome all at the same time. I queried a handful of publishers. I think three or four requested the novel, but I picked J. Taylor Publishing. They asked for a slight rewrite to fix a few small details. I made the corrections and sent the novel back to them. A few weeks later, they wrote back and asked how I felt about signing on for a trilogy. My response came in the form of screaming like a little kid and flailing my arms a lot. There’s a quote somewhere that goes roughly like this: If you have any young friends that want to be an author, do them a favor and kill them while they’re happy. That’s a little harsh, but a fairly accurate quote. Writing, especially writing to get published, is hard and painful and makes you want to yell a lot. My best advice is to find friends and don’t quit. What’s a common misconception about publishing that needs to be addressed? That it leads to any form of monetary gain whatsoever. Kids, don’t write for money. There’s none to be made. That doesn’t mean you can’t have a lot of fun along the way, though. I’m everywhere…sort of. I tweet, a lot. I have a Facebook, but I’m not a big Facebooker. You can find links to all of my books on my website or you can go here to get started on my Beasts of Burdin trilogy.